I wouldn't have thought a Milky Way in spread form would work, but I've been proved wrong. The new offering from the big whigs behind Milky Way have turned the familiar chocolate bar into a spread. I found this in Sainsburys, and with my interest caught, headed to the til. 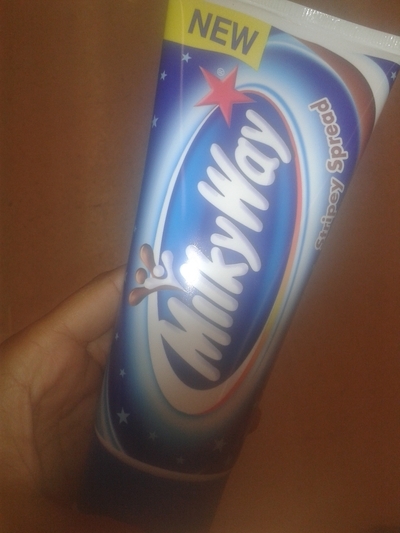 For £1.99 you get a 350g tube of chocolatey Milky Way goodness. I was dubious about how this turn out, but I needn't have worried. The spread is a smooth and delicious version of the chocolate bar. When you squeeze the bar, you get a chocolate and creamy filling. It is fantastic when swirled on top of ice cream, or, if you're a creative one, on digestives. Grab knife and get spreading.